The Mitsubishi F-1 is Japan's first domestically developed jet fighter, and was the first fighter to enter production in Japan since the end of World War II. Mitsubishi Heavy Industries and Fuji Heavy Industries jointly developed the F-1. At first glance, it resembles the French/Anglo SEPECAT Jaguar, but was a completely independent Japanese effort. The F-1 evolved from the earlier Mitsubishi T-2 supersonic jet trainer. To create the F-1, engineers simply removed the rear seat and faired over the canopy, using the new empty space for avionics. The F-1 also has a J/AWG-12 radar set, similar to that fitted in British Royal Air Force F-4M Phantom fighter jets. This set provides ranging information. Aside from the avionics changes, deletion of the rear seat, and new one-piece windscreen, the only other major change from the T-2 was the beefing up of the aircraft to enable it to carry a larger weapons load than the T-2. The F-1 is fitted with an internally mounted JM61A1 Vulcan cannon of 20 mm caliber with 750 rounds of ammunition. The aircraft also has seven external hardpoints for the carriage of a wide variety of stores. The fuselage hardpoint and inboard pair of underwing hardpoints are "wet", which means they can be used to carry external fuel tanks to increase the aircraft's range. The primary weapon of the F-1 is the ASM-1 and the newer ASM-2 long-range anti-ship missile. This weapon is roughly in the class of the American AGM-84 Harpoon or French AM.39 Exocet. Other weapons carried include the all-aspect short-range heat-seeking AIM-9 Sidewinder air-to-air missile for air-to-air combat. This weapon is carried on the wingtip rails usually, but it can also be carried on the outboard underwing hardpoints for the F-1's secondary air defense role. Other air-to-ground weapons carried include rocket pods (JLAU-3/A) of 70 mm size as well as bombs of 500 and 750 pounds in size (Mk82 and M117 respectively). In addition, the Mk-82 and M117 bombs can be fitted with infrared guidance kits, turning them into precision guided weapons that home in on heat radiation emitted from seaborne targets such as ships or other ground-based targets. When fitted with this kit, the bomb becomes known as GCS-1. The F-1 has slowly been replaced over the years by the newer Mitsubishi F-2 (Japan/U.S. developed, based on F-16C/D), as well as upgraded F-4EJ "Kai" Phantom II's. Units currently using the F-1 are scheduled to change over to the new F-2 over the next several years. One unit has already traded in its F-1's for F-4EJ Kais. 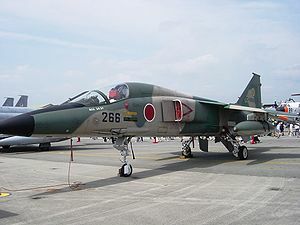 Six F-1's based at Tsuiki in Fukuoka Prefecture were retired on March 9, 2006, having reached the 4,000 hour limit of their airframes. - FS-T2-Kai : The first two prototypes. - Mitsubishi F-1 : Single-seat close-air support, ground-attack and anti-ship fighter aircraft. - Various bombs, air-to-air and air-to-surface missiles and rocket pods on four underwing, two wingtip, and one underfuselage pylon. Weapons carried include AIM-9 Sidewinder, Mitsubishi AAM-1, Mitsubishi ASM-1/2 anti-ship missiles, JLAU-3A 70 mm rocket pods, RL-7 70 mm rockets, RL-4 125 mm rockets, Mk-82 500 lb and M117 750 lb bombs, and GCS-1, IR-guided versions of the Mk-82 and M117.